Congratulations on the up and coming screening at FRIGHTFEST in London! First of all, what does this mean to not only you and those involved to screen their but to the reputation of the film as you submit to other film festivals around the world? It’s a great honour to be screening there. FRIGHTFEST has always been a festival I’ve wanted to screen at, so I’m very excited. I think the film will play very well to an international audience, so I’m delighted that they are the first to see it. My hope is that it will get the ball rolling for screenings at other festivals I will be attending; and it will be my first time in London, so also thrilled about that. If I am correct, this is your fourth feature with ENCLOSURE and the latest since 2013’s NAILBITER. Both films are classic examples of isolation in a very vast area. What creativity ticks inside you to cultivate a micro thriller storyline in a macro world of horror? This is my third feature. I just completed principal on my fourth, which is actually a family film titled “Duke”. Yes, absolutely! I think that like NAILBITER; ENCLOSURE is a container film, but with bigger ideas that deal with marriage and pregnancy. While, “Nailbiter” was more focused on the creature aspect, ENCLOSURE emphasizes more on the human element. Ultimately, I think the best ‘container’ horror films focus on the characters and less about the threat. I think the ‘container’ horror film really gets my creative juices flowing, because we have to really work hard to keep things interesting for the audience. It’s not easy making a film like this, despite not having many locations. It actually becomes way more challenging to find ways to keep the audience engaged while being in primarily one place. One of the challenges I have no doubt, but also impactful parts of ENCLOSURE, is the sound work and editing. What was process like especially being outdoors and doing night shoots? Also, talk the soundtrack and having it fit for the forest? All of aspects of post were crucial to making this film work. The sound design and editing were all done masterfully by Phillip Blackford (The Invitation). A lot of time and meticulous detail was spent to make it really work and create the world around the characters. While shooting the movie, we spent half the schedule in the woods and half the schedule on a sound stage. Very little of the film was actually shot at night. Due to the expense of shooting night exteriors, most of those scenes were shot entirely stage bound, where we could control the lighting. 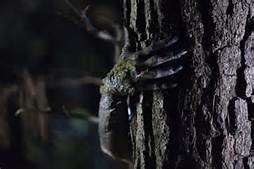 As for soundtrack, we wanted to create something haunting that would help build upon the mythos of the creatures as well as the ‘low country’ setting where we shot the film. South Carolina is a beautiful ad very scenic state. Did the natural colour and light within the forest location transform ENCLOSURE into more of canvas rather than a set? Absolutely! It really took the film to another level. Originally the film was written to take place in the Ozarks, but when we moved it to South Carolina it opened up a whole new world of possibilities. We spent several days just filming trees, and other foliage to allow us to build the world around the characters. One of the coolest days was filming the boat scene, when Charles and Dana travel to an isolated section of the Low Country. I really wanted the film to seem vast in the first act, and then as we approach the second act the film shrinks in scope inside the tent. ENCLOSURE was shot on the RED camera. What difference did this make? You have a heavy focus on photography in this film, what did this add to the depth of Dana and the overall theme of the film? I think the RED is only as good as it’s DP. Harry Lipnick did a great job as the cinematographer on this film and we had a great crew help add to the look of the film, including Production Designer, Leslie Keel (May). The RED does give you a lot more latitude when it comes to colouring the film, and our colourist Taylre Jones (The House on Pine Street) did an awesome job. We wanted the film to be beautiful and classically shot, versus overly shaky, handheld. There are a couple sequences where the handheld aesthetic worked, but I mostly wanted this to feel very rich and beautiful despite being set deep in the woods where the characters are being threatened. We discussed early on about giving it an almost fairy tale look. Talk about Michelle Davidson’s writing talents on this project? What was the creative collaboration behind the couple’s complexity within their relationship? This relationship changes over the 100-minute running time, what personal ties in your life and relationship did you bring to Dana and Charles? What did Davidson bring to it? Michelle has been my writing partner on several short and feature length scripts. I had approached her with the concept early on and we wrote a very early draft that was set in the Ozark Mountains in Missouri. She and I work very well together and it was just a system of us ping-ponging ideas back and forth. We wanted the film to have a very strong female theme that ran as a spine throughout the whole story. Having a female co-writer was essential to accurately building this layer to the story. She brought a voice to Dana, and helped shape the characters and creature back story, so that it was more than just a run of the mill ‘woods’ based horror film. It’s also important to note that my wife was pregnant while we were writing the script, which had a definite influence. Charles’s being a musician in the film and myself being a filmmaker were parallels. Like any artist, having a child can be scary since there is a tendency to feel like you’ll lose your ability to continue your art form. I think that was a fear I had, that seeped into the script. We also wanted to explore the concept of a couple having troubles and forcing them to deal with in an enclosed setting. I often thought of Sean’s character as a dark therapist, who influences them in facing their problems while trapped in this life or death situation. Talk about the castings of not only Fiona Dourif (Dana) and Kevin Ryan (Charles) in these very tense and vulnerable roles? What energy and infamous performance does Jake Busey bring? Was there a particular performance of Busey’s that really sold you on him in the casting? We knew that casting was going to make or break the film, so we spent a great deal of time reading actors for the roles. Kevin Ryan (Guilt, Copper) was the first to be cast. His audition blew me away. I had been a fan of Fiona’s since seeing her in CURSE OF CHUCKY, and we felt she could bring interesting layers to Dana’s character that may not have been on the page. We were taking a risk, since we did not get a chance to read Kevin and Fiona together. The film was shot between Thanksgiving and Christmas, so we had to move fast. Luckily, while on set the two had great chemistry that elevated the characters to a new level. As for the role of Sean, we wanted to bring someone in who looked nothing like Fiona and Kevin, and also carried a since of gravitas and menace. Jake definitely delivered that aspect to the character, and thankfully when the three of them were put in the tent together, it all worked well. Unlike NAILBITER, the little tent offers so much more vulnerability. The way you choreograph the creature’s movements, the struggle within the tent and the physical destruction of the tent is symbolic of the relationship between the married couple. Can you talk about placing the majority of the narrative within there and if what I observe is correct? You completely get it. 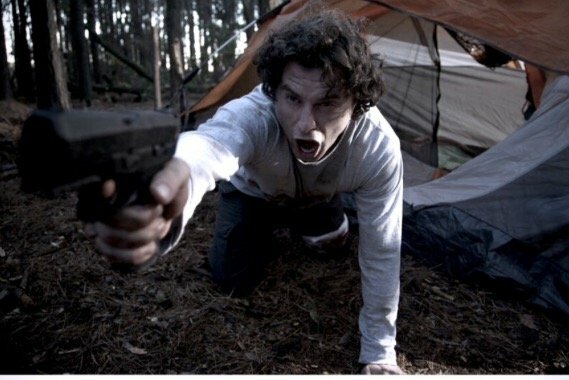 The tent location and supernatural threat forces these characters to deal with their baggage and I think that is why the film works well as a not only a thriller but a character piece. There is an arc to their characters that we see happen while they are trapped that I think brings the film to more of an emotional climax. Where did the idea for the creatures come from? What power does it give the director to keep the monster off the screen until needed? Well, the creatures back story changed when we moved the location of shooting from the Ozarks to the Low Country. We originally had more of an “Indian folklore’ aspect to the story, but we altered that to incorporate the ‘Gullah’ into the mythos. The Gullah culture exists within the Low Country regions of South Carolina and Georgia and we felt it would make a great addition to the story. And without discussing too much, we always had the plan of making the creatures female to retain its central theme. As for keeping the creatures hidden, I always feel like it makes for a stronger film. Movies like “Jaws” and “Alien” are very successful by holding back on revealing the monster early in the film. While making NAILBITER, I made some of the crew watch ALIEN. We time how long the creature is actually on screen and it came out to less than five minutes, I believe. However, you feel like the creature is there the whole time, which helps create a real palpable sense of dread. I love that the creatures are primarily practical. What did the human aspect bring to the movements, personality and costuming of these creatures? I mean, it was essential to do them practical. We had a very talented make-up artist, Megan Areford, who has done great work on VHS: VIRAL, THE DEVIL’S CARNIVAL and other horror films. We also had a wonderful actor, Bruce Williamson, who had the right body type to play the creature. He did an amazing job of creating haunting movements and personality for the creature. The make-up took hours to apply and a long time to remove, so we had to move fast to photograph the creatures, which was very challenging, but I’m thrilled with the results. How important was it to present an authentic perspective to survival in the woods? I think the ‘woods’ horror film has been done a lot, so we wanted to give it a fresh spin and make it interesting. The film again, relies heavily on performance since you follow these three characters through the whole piece. I think keeping it mainly ‘tent’ bound gives it a different vantage point, as well as retaining the ‘female’ theme to set it apart from other woods-based films. What was the challenge of editing ENCLOSURE? How much did it not reflect the pace of the film but make the third act seem more fluid? Like any film, you have to refine the edit over and over to get the best out of the performances you capture and still keep the story flowing well. 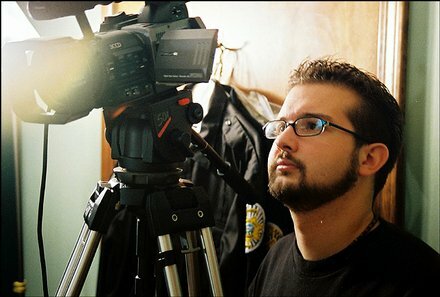 The film’s principal photography was done in a tight 12 days, so we really had to work overtime to make sure we were getting what we needed. I had storyboarded the film ahead of time, which served more as a road map, which we had to divert from on numerous occasions. I always felt like the movie was moving towards a more ‘emotional’ pay off than anything else, so we just kept that in mind while shaping the film. We also had a lot of special effects in the third act, which were created by Ron Hurley (VHS: Viral, The Invitation), so we wanted to make sure each piece fit correctly in the edit before handing a multitude of shots over to Ron for VFX work. 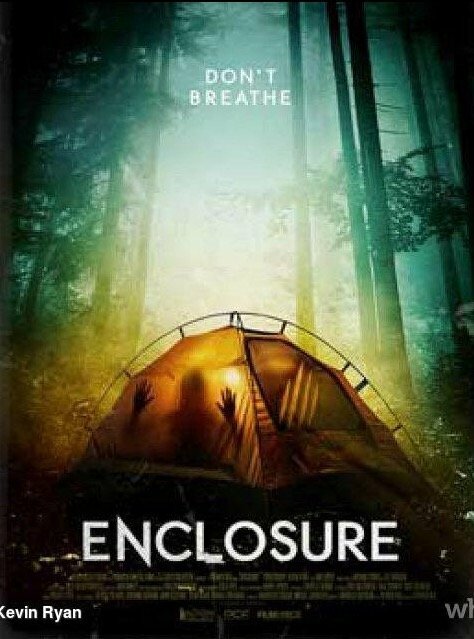 With ENCLOSURE playing 3:45 PM on Friday, August 26th at FRIGHTFEST, where will we see ENCLOSURE next after FRIGHTFEST? Where can we find out more? We have a few more festivals we are waiting to announce. Also, waiting to hear on a distribution plan, but I’m sure there will be news soon! Check out our reviews of Patrick’s 2015 short film ‘Pillow Fright‘. Head to our Horror section for many more horror film reviews and content!! !